I used to slice fresh mushrooms and throw them on a pizza without a thought. Those pizzas were fine, but they were squandering so much potential. And mushrooms are absolutely brimming with potential. When treated properly, they can be umami bombs–so juicy and meaty and savory. But for that potential to be realized, they need to be roasted before they go onto a pizza. You don’t even need to use fancy mushrooms. 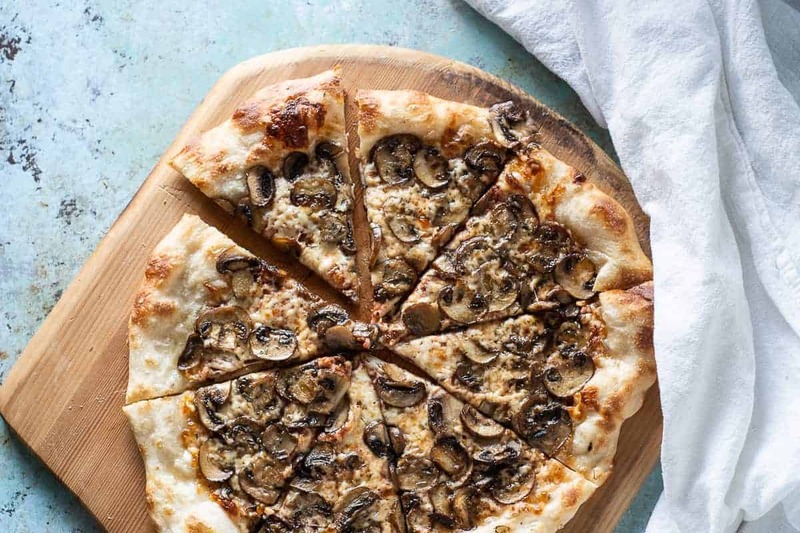 I mean, I love morels and chanterelles and porcini and hen of the wood mushrooms as much as the next mushroom fan, but they’re splurge ingredients, not regular pizza night ingredients. 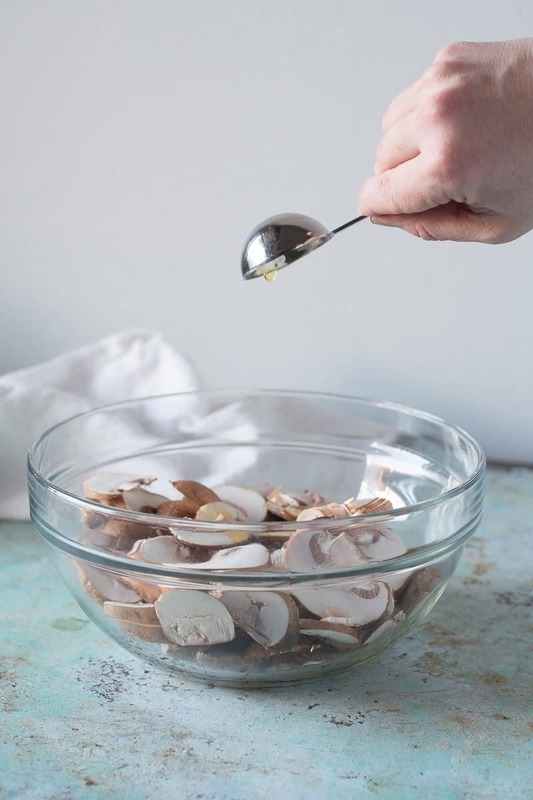 And there’s little point in splurging when you can coax so much flavor out of the humble cremini (sometimes spelled “crimini” and also sold as “baby bellas” or “baby portobellos,” which is actually what they are). You could, and I have, even do this with white button mushrooms. But I think you get a sufficient enough flavor bump for the small price difference to go for their brown brethren here if you have the option. 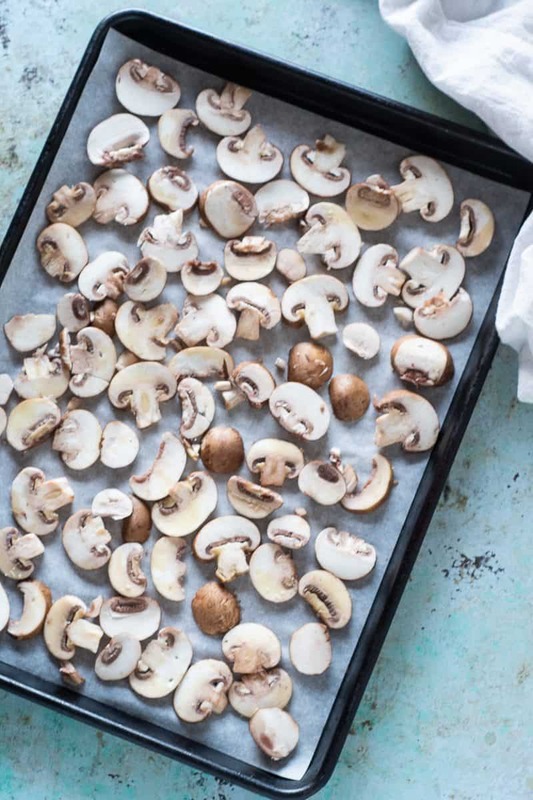 Roasting them in a hot oven shrinks them down and concentrates their flavor, meaning you get a more intense wallop of mushroom-iness in every bite. The trick, though, is not just roasting them, but slicing them thinly (though not paper thin), tossing them in a bit of olive oil, and, ahem, this part is important: roasting them in a single layer. If you throw them in a pan all willy nilly, they’ll overlap and they’ll steam and they won’t release all that moisture and develop those swoon-worthy caramelized edges. The convenient thing about this is that you can do the roasting while you’re heating your oven as hot as it will go, preferably with a baking steel inside. The other tricks are the same ones I use for basically all of my pizzas. Regardless of what dough you use, let it rest at room temperature for at least a half hour and preferably an hour before you bake it. Preheat your oven as hot as it will go (usually this is 500-550°F) for at least a half hour and preferably an hour before you bake it. 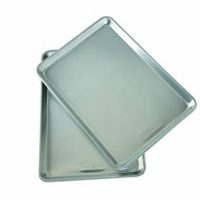 If you have a pizza stone or baking steel it should be in that oven on the highest rack before you turn it on. 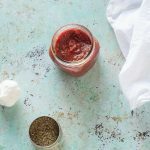 Use a simple, uncooked tomato sauce. (Here’s my 5-minute pizza sauce.) And apply it sparingly. Use a mix of grated mozzarella and finely grated parmigiano reggiano cheese. 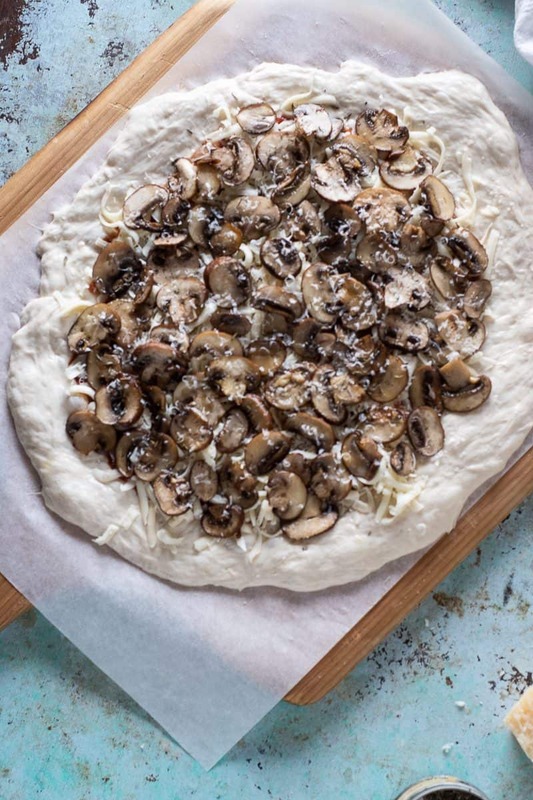 I like to build a pizza on parchment paper and slide it, parchment paper and all, into the oven onto a preheated baking steel or pizza stone. If you don’t have pizza stone, you can bake it on a sheet pan (I’d still line it with parchment for easy clean up). The results won’t be quite as amazing, but it’ll still be delicious. I like to let it cool on a rack for a few minutes after it comes out of the oven before slicing it. This helps to keep the crust crisp and avoid the dreaded soggy bottom. And then, my friends, you can slice it and dig in! Roasting the mushrooms ahead of time concentrates the savory mushroom flavor so you get more caramelized, umami goodness in every bite. 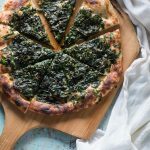 You can use any pizza dough recipe you like here (my recipe is linked below), or even start with a ball of pre-made dough like those available at Trader Joe’s or Whole Foods. The most important things are to let your dough rest overnight in the refrigerator, then stretch it gently into shape (no rolling pins!) and to crank your oven as high as it will go. A pizza stone is nice to have. A pizza steel is even better. But a sheet pan will work if that’s what you have at home. I like to grate my parmigiano reggiano with a microplane zester, which makes fine shreds of the hard cheese. 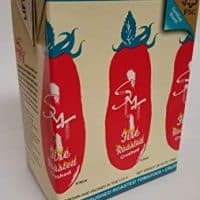 I like to grate my mozzarella with a box grater, which works better for the softer cheese. 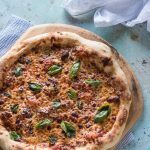 I usually build my pizza on parchment paper, and that works for me–if you’re good with a peel, feel free to skip the parchment. 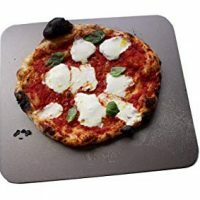 About one hour before you want to eat, preheat your oven with your pizza stone or baking steel set on the highest rack inside (no need to put a pan in the oven if you don’t have a stone/steel) to 500-550°F (as high as your oven will go). Make sure your pizza dough is resting at room temperature. After the oven comes to temperature. 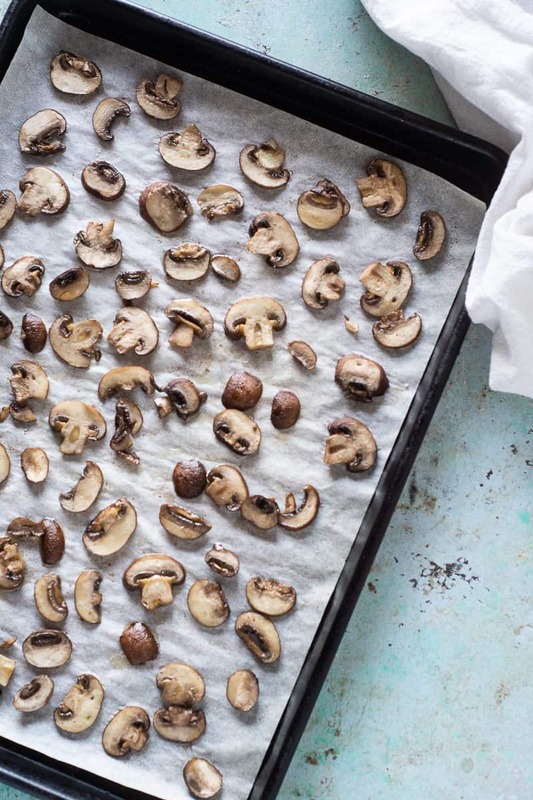 Toss the mushrooms with the olive oil in a mixing bowl and spread in an even layer on a baking sheet (if you like, you can line it with parchment or aluminum foil for easy clean up). Don't worry of some the mushrooms look dry--they don't all need to be coated in oil. Make sure the mushrooms are not significantly overlapping or they'll steam. They should fit, just barely, in a half sheet pan. Roast for 8-10 minutes, or until the edges are starting to brown and the mushrooms have shrunk significantly. Let cool until cool enough to handle, 5-10 minutes. 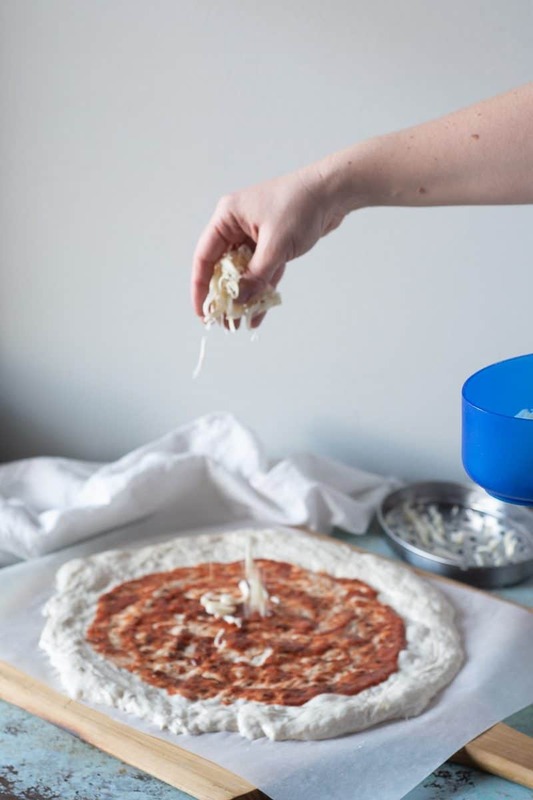 Set your pizza dough on a piece of parchment paper set on an inverted sheet pan or cutting board (some kind of flat, moveable surface), and gently stretch into a circle or oval as large as will fit comfortably on your pizza stone (or steel or baking pan). Mine is usually about 14-inches in diameter. Sprinkle with a pinch of sea salt or kosher salt, focussing especially around the edges. Spread tomato sauce sparingly over the dough, leaving about an edge around the edges. Add the mozzarella and a grating of parmigiano reggiano cheese over the top. Then add the roasted mushrooms, nestling them close together this time. They should all fit, but just barely--it's ok if they overlap now. If desired, sprinkle dried thyme over the mushrooms and add a few cracks of black pepper. Then add a little more parmigiano reggiano over the top. 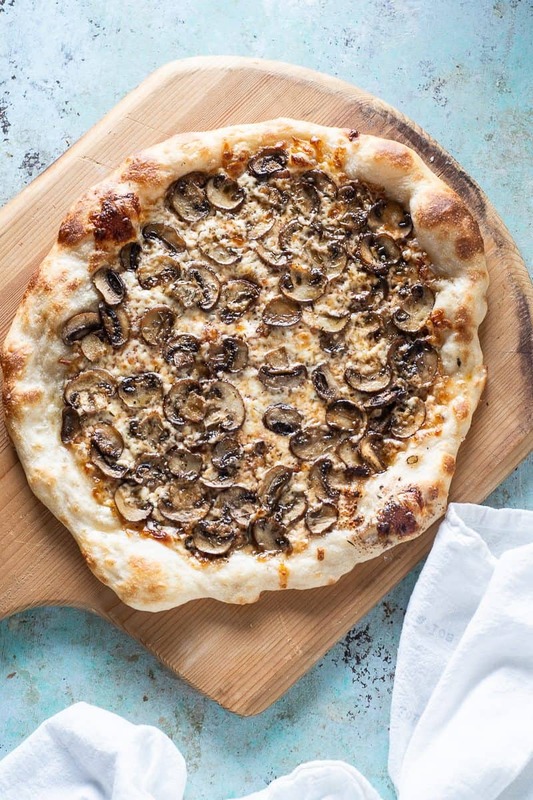 Slide the pizza (parchment paper and all) into the oven onto your pizza stone or baking steel and bake for about 8 minutes, or until the crust looks gorgeously browned and the cheese is all melty and the mushrooms are even more shrunken. Cool on a rack for about 5 minutes. I loveeee mushrooms! This is my ideal pizza if anyone would eat it with me haha, can’t wait to try this! Wow! 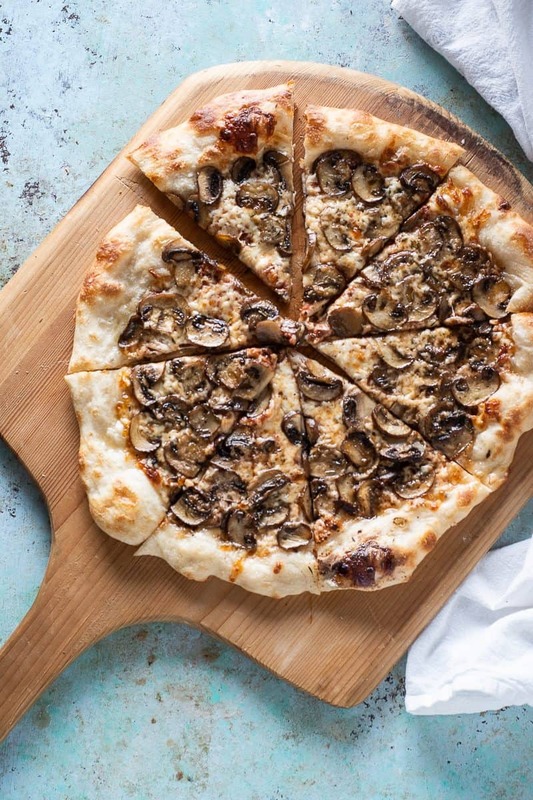 this mushroom pizza looks delish. 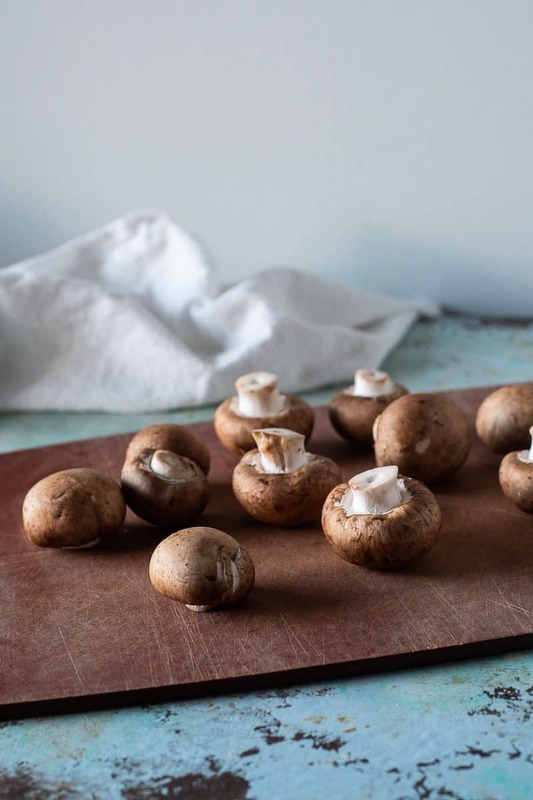 What an incredible idea to include healthy mushrooms in one’s diet. Thanks for the recipe. The best adult pizza I’ve ever had! The best part is I don’t have to share with the kids. Now that pizza looks amazing! Love the photos!